As a high-fat, moderate-protein and low-carbohydrate eating plan, the ketogenic diet is a dream for bacon-lovers, heavy cream-adorers and the vegetable-enamored. However, it's not so appealing for spaghetti enthusiasts, bean supporters or the fruit-obsessed, given that all those carbohydrate-rich foods — and more — are off-limits. If you've decided to hop on the ketogenic bandwagon, meal planning will become a necessary pastime. For your own sanity, set aside time each week to write out a ketogenic meal plan, make a grocery list of ingredients and shop for all sorts of ketogenic necessities. The ketogenic diet originated as an eating plan to control seizures in people who suffer from epilepsy — meaning, at its heart, keto is a therapeutic diet and not simply a way to drop weight quickly. It's typically prescribed by a physician to children who don't respond well to anti-seizure medications and then carefully implemented and monitored by a registered dietitian. Given the increase in popularity of the keto diet, though, a good number of recent followers nowadays are likely more concerned with weight loss and other health benefits than its relation to epilepsy. The goal is to coerce your body into using fat for energy rather than its preferred fuel source of glucose, or sugar. This fat-based fuel is known as ketones, which are produced by the liver from the stored fat in your body. When your body is using ketone for fuel, you're said to be "in ketosis." The keto diet differs from other low-carb eating plans, such as Atkins, because it emphasizes fat consumption, rather than protein. Nuts and nut butter: Almonds, cashews, pecans and walnuts — essentially all types, though peanuts are technically legumes. Their inclusion in the keto diet is debated and perhaps subject to personal preference. Sometimes, it can be hard to tell if a product fits into the ketogenic meal plan. Take a look at the list of ingredients. If you see anything that resembles sugar on that list, put it back on the shelf. 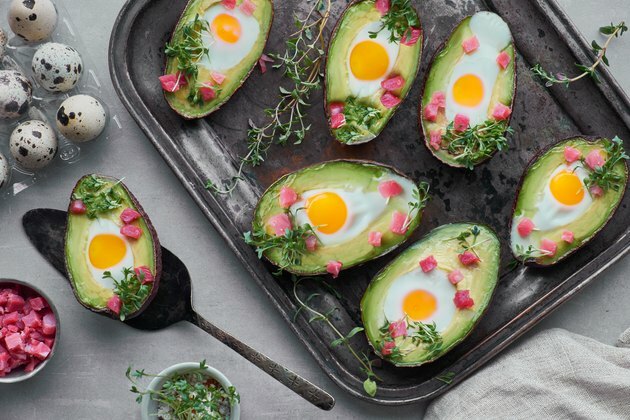 The easiest breakfast on the ketogenic diet — and one that many newbies turn to — is a form of eggs and breakfast meat. You can scramble, poach, hard-boil or fry the eggs, depending on your preference. If you have the skills, you can also whip up an omelet filled with cheese and veggies. Pulling through a drive-through or hitting up happy hour with friends won't be as easy as it once was, but you don't have to swear off restaurants forever when you're following the keto diet. The key to staying successful is to prepare in advance, ask a lot of questions and don't be afraid to make modifications. For example, when at a regular American eatery, a keto-friendly meal can consist of a hamburger with pickles, onions, tomatoes, lettuce and mustard. If you really want to hold the burger with your hands, ask for a big piece of lettuce and wrap it all up. Skip the ketchup and the bun. Instead of French fries on the side, ask for a side salad. Just be prepared to pay a bit extra. Any sort of grilled or baked meat with extra butter or olive oil, but without sides of fries, rice or noodles. Ask for extra vegetables instead. Don't be afraid to ask questions of your server, even if it involves asking them to go back and check with the cooks about how items are made. It's perfectly reasonable to want to know if a sauce is thickened with starch, if the meat has breading on it or if the dressing was made with sugar. Keto was designed for people who suffer from epilepsy; however, that's not to say that it doesn't have research backing up its benefits beyond controlling those symptoms. Weight loss: A systematic review and meta-analysis of studies published in 2017 in Obesity Reviews determined the ketogenic diet can be effective in suppressing appetite and helping people feel less hungry. Memory preservation: A rodent study published in 2017 in Cell Metabolism found that the ketogenic diet reduced midlife mortality and helped to prevent memory decline in mice. Type 2 diabetes management: A 2018 study published in Diabetes Therapy determined that nutritional ketosis improved biomarkers for diabetes and reduced medication usage. Additionally, this particular eating plan might not satisfy all your micronutrient needs. Talk to your doctor about supplementing your diet to ensure that you're getting the vitamins and minerals that you need for a healthy life. Read more: How Long Does It Take for the Ketosis Diet to Work? Obesity Reviews: Do Ketogenic Diets Really Suppress Appetite? Harvard Medical School: Harvard Health Letter: Should You Try the Keto Diet? Harvard Health Blog: Ketogenic Diet: Is the Ultimate Low-Carb Diet Good for You?